I’m actually a huge fan of survival horror games (something you may have picked up from listening to the podcast) and when I got my PS2 and spending what seemed a couple of minutes with the mediocre launch titles I was aching for a next gen survival horror experience. Flicking through the typical advertising leaflets found in game boxes at the time I came across an odd game called Extermination which looked like it would scratch that itch. There was very little info on this game even in magazines at the time, the best I could get before launch was a video trailer in one of the Playstation magazines I brought. And I’ll just be honest that trailer looked pretty cool. The graphics looked solid, the game was set in a Arctic environment that to me felt reminiscent of John Carpenter’s The Thing, but there was a lot of mystery to the trailer. You didn’t know the story, you didn’t really know much about the threat, other than it was some bizarre mutated virus that seems to create giant Rhino like monsters. I was hyped and sold and was in on this game day one. Launch comes in June 2001 surprisingly a month before the US release which is a rare sight even today. I have to say on a first impression and even today I really admire this games design. Yes, the John Carpenter influences seem even more evident right down to the tense and at times impressive score the game delivers. In the game you are placed in the shoes of Dennis Riley who resembles your typical generic male actor from the late nighties right down to the haircut. Dennis along with his marine pal Roger Grigman arrive at Fort Stewart in Antarctica after receiving a distress call. As with all calls of distress in a horror setting things are of course not going to go well for you. Soon after entering the facility you find the place kinda empty. But it doesn’t take long before you get attacked by what looks like mutated land rays that wriggle around on and floors and spew green goo at you. You find as you progress through the game the facility is gradually being overtaken by a gelatinous red tumour. It was back then and even today is quite refreshing to see a game environments you revisit, gradually just deteriorate and get taken over by this infection. The games graphics have aged as you expect for a PS2 environment. Like Resident Evil: Code Veronica X those full 3D rendered environments looks very empty and character models look like Barbie and Ken dolls with there perfectly shaped faces. The enemies look impressive mostly comprising of mutated humans and creatures but you will see no dismemberment on damaging these baddies just the obligatory burst of blood we are used to to indicate your hit was successful. Extermination is of course about survival, ammo is very limited but the game doesn’t do the best job of translating this. Dennis is after all packing a multi tooled assault rifle. Its like it presented that big red button in front of you with a sign that says “Now don’t press this now,” and of course your going to . But once you have literally wasted all your ammo for your shotgun attachment on those frustrating land rays which are everywhere you realize you’re screwed. 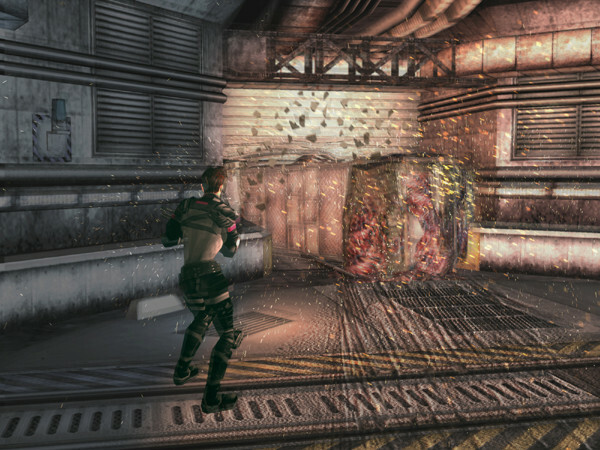 This is not Dead Space or Resident Evil 4, ammo ain’t coming back, you need to run more than shoot. On that note of shooting Extinction brought in manual aiming years before Resident Evil 4 considered themselves the innovator of the style. Of course Resident Evil 4 does it better because at least when Mr. Chainsaw man comes to chop your head off he slows down two seconds when he gets near you while your cemented in place aiming your weapon. In Extinction your stuck in place while aiming while some of the enemies are literally zipping round you. But despite all this I loved this back in the day. 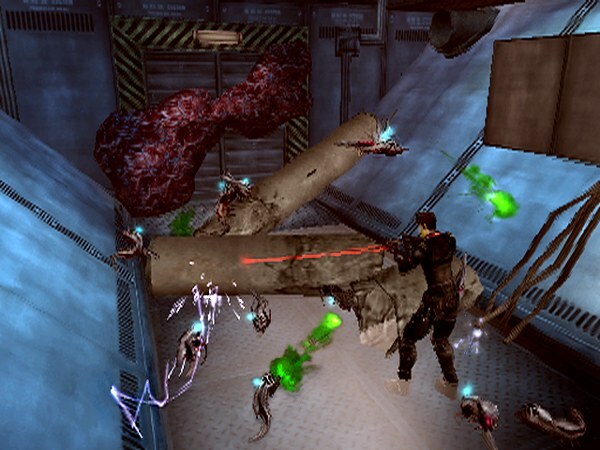 A very unique mechanic introduced to the game was the “infection system.” Dennis could literally become infected with the virus which would cause your health to deplete slowly and even cause the games infected environment to harm you. The only way to remove the infection is to take the antidote and find a health station. This added incredible tension to the game, you literally saw a infected pustule on Dennis’ back as you urgently get cured. So how many of you like that budget horror title Deadly Premonition well it may surprise you (but possible not if you actually played this game) to hear that one of the games creators Hidetake “SWEARY” Suehiro was one of the designers of Extermination. I guess that sort of makes sense, since the acting in this game is atrocious making some of the one liners in this make the ‘Jill Sandwich line,’ from Resident Evil feel Oscar worthy. Not only that, but the lip syncing doesn’t even match in this game and its just awful. Now when researching the creation of this game you learn Extermination was developed in house by Sony and was basically was a game to showcase the capabilities of the system to other developers and consumers. I guess it just made sense to Sony to release a full product and make some money off it rather than leave it as a tech demo. This game received very poor to average reviews at the time and while that is probably fair there really is a lot of merit to this game the multi tooled gun was a nice feature even if you are heavily discouraged from using it. The unique infection system is something I haven’t seen done as effectively in modern games. The closet resemblance I can think of is Resident Evil: Operation Raccoon City, Extermination still does it better. Overall, Extermination is definitely worth a look, it can be found incredibly cheap online even to this day, so if your looking for something different to scratch that survival horror itch or you want to see SWEARY’s origins in game design there’s a lot to enjoy with this title. Obscura Horror Verdict: Will make you want to watch John Carpenter’s The Thing. Thanks for the review. Never even heard of this title. No problem my friend. It goes under the radar a lot now but when I first got my PS2 this was actually my most anticipated game as it was in the horror genre. It’s not a great game but there are very interesting design choices here that were quite ahead for the time.